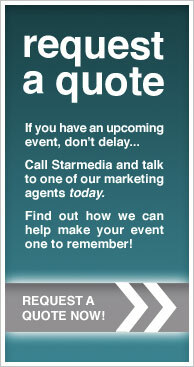 Starmedia Event Marketing...your ticket to success! Starmedia Communications owner Alex Cholella - an integrated promotional advertising firm. We operate out of Montreal, Canada, reaching a wide variety of clientele and offering a unique blend of creative, marketing and advertising solutions. Our creative team is a talented blend of designers, writers, and project managers all committed to the singular goal of producing results for our clients. Our advertising firm is recognized in Montreal, Canada, and across the US, as a premier resource for the development and execution of marketing programs, de- signed to increase conversion, online traffic and generate sales. Successful marketing plans can vastly increase your return on investment and bring in new customers. We are committed to providing our clients with unique marketing tools, outstanding designs, marketing strategies and advertising design initiatives. © 2009 Starmedia Communications, Inc.